An hour of music from 2-3pm in the main program room. Free concert and open to all. 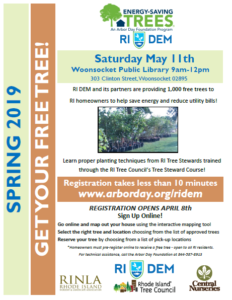 Tree pickup for pre-ordered trees from RIDEM in the library parking lot., 9am-Noon. Meet the Author: Joyce Derenas , author from Worcester, MA, will offer a talk and book signing from 2-3pm. Book is titled: The Long Shot, a French Canadian Saga, Book 1. Free and open to all. Winners are invited to share their poems at Open Mic Poetry night 7-8:30pm. Come and meet 20-30 RI Authors who will be here with their great books, available for purchase and signing for all ages. Free event in the main program room.